A BRISBANE ministry providing pastoral care to the mentally ill has something it wants to share with anyone prepared to listen. A delegation from Brisbane archdiocese’s Catholic Psychiatric Pastoral Care (CPPC) to World Day of the Sick in Adelaide in February, has returned home with hopes of their ministry being a model for other dioceses throughout Australia. The 11-member delegation spread the word about their pioneering method of Catholic psychiatric pastoral care to other conference delegates, but were disappointed they were not asked to give a formal presentation. Mental health and human dignity was nominated by Pope Benedict XVI as the focus of the 14th World Day of the Sick. 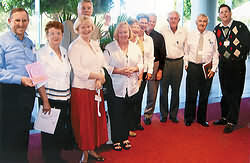 The Brisbane delegation included Fr Jim Smith, Janine De Maria, Mary, Peter and Mick Long, Carmel and Jack Gee, Lois Baldwin, Trish Hinton, Dr Ken Pakenham and Christian Brother Len Marshall. CPPC chaplain Fr Smith said he was pleased with a number of aspects of the conference. “The Pope’s World Day of the Sick message was a gift to the Church in giving the much needed encouragement and directions for so many in the Church who wish to provide for its many members in need,” he said. Fr Smith said the pastoral day of the conference attracted many people hoping to gain information about how to set up pastoral ministries and be supported in their work with people with a mental illness. “Many people are aware of the big need but struggle to know how the Church can respond,” he said. Fr Smith said he was pleased to see so many bishops present from the Oceania region, eager for their dioceses to provide pastoral support for Catholics and others with a mental illness. He said it probably would have helped those present on the pastoral day to have had some speakers who were directly involved in providing psychiatric pastoral care and speakers who have received pastoral care that has helped them integrate their faith and the experience of a mental illness. “As the day went on the people could see what they were looking for we had started and have a proven diocesan model of psychiatric pastoral care,” he said. Fr Smith said the Brisbane delegation did receive a very interested response from the Vatican delegation. The delegation took back with them a CPPC handbook and the pastoral carers training course handbook. In Brisbane, CPPC pastoral carers visit 10 hospitals and 10 hostels on a weekly basis and provide a community centre in Morgan St, Fortitude Valley from 9.30am-3pm Monday to Friday for people with a mental illness. Fr Smith said CPPC helped about 1000 people a week through its ministries. CPPC co-ordinator and co-founder Janine De Maria said that in going to Adelaide she hoped that CPPC could encourage more people to set up similar ministries. Mrs De Maria said there was a need for a place for people to come together to have their faith acknowledged, nurtured and grow. “This is the whole thing about the importance of CPPC,” she said. “It is so difficult for people with a mental illness to fit into the average parish and so important to have people trained by the Church especially in psychiatric pastoral care. “That’s what I was thrilled about, that Pope Benedict has seen and acknowledged this,” she said. Mrs De Maria said many lasting relationships were built up at CPPC. “Faith binds us together at CPPC,” she said. There were some people at the conference who called on the Church to engage in political lobbying for the needs of those with a mental illness. Fr Smith and Mrs De Maria said that in the early days of CPPC, the importance of retaining its pastoral focus was always emphasised. Brisbane Auxiliary Bishop John Gerry spent a week with CPPC experiencing the pastoral dimensions of the various ministries. CPPC parent Jack Gee said people were aware of the need for pastoral care for those with a mental illness, but didn’t know how to go about it. He said community centres had to be established around Australia to provide an area for people with a mental illness to get involved in activities that might help them, whether it was skill development or companionship. CPPC member Trish Hinton said groups like CPPC helped people with a mental illness to not feel so isolated. “We are just so privileged to have that in Brisbane,” she said. Another CPPC member Mick Long said what the conference did for him was to confirm that a person was not defined by an illness. “We are people not an illness, rather a person with an illness,” he said. Carmel Gee said the mental health patient should be seen first as a person who had talents, hopes and dreams like everyone, but these had been suppressed because of their illness. “And this applies to the families, who at times also feel the isolation that their family member is experiencing,” she said. Parents Peter and Mary Long commended CPPC on its work and recommended that it be set up in every diocese throughout Australia. They said more centres like CPPC needed to be created and resourced through dioceses to meet the growing needs of the mentally ill, especially since Federal Government funding seems to be on the horizon. “The lack of any practical alternative example from anywhere else in the Church is a stark reminder of how far we have to go and reinforces our appreciation for what the CPPC team has achieved for all their members and their carers, family and friends,” they said. Pastoral carer Lois Baldwin said that in Adelaide there were a lot of individuals with wonderful intentions, but discussions never went beyond working in a hospital or working in someone’s home. “That’s what came from the parents who were talking, that there was nobody else who could come in to pick up the pieces, help with the spirituality or just make someone feel comfortable when they went into hospital,” she said. Lois Baldwin said the CPPC ministry had been described as “God’s workshop” by a patient at a Brisbane hospital. Dr Ken Pakenham said the Adelaide conference affirmed and reinforced for him what was being done in CPPC in the Archdiocese of Brisbane. He said it was exceptional that Brisbane had established such an innovative model of pastoral care almost 20 years ago and there was a desperate need for other dioceses to provide a similar ministry. Pastoral carer Br Len Marshall said, with more than 60 pastoral carers, CPPC was leading the way in helping to care for those with a mental illness in Brisbane. “In these days when we need the lay people to be doing more, we can give them something to do in a way that they stay in the ministry for many years,” Br Marshall said. To find our more about the work of CPPC phone (07) 3252 5641.